Around the World in 20 Street Foods #Infographic ~ Visualistan '+g+"
Travelling around the world is an experience like no other. Soaking up lots of different cultures and ways of life truly is life changing. There are many ways to fully immerse yourself into different cultures when heading off abroad, one of the best is to try their local cuisine. Although our high streets are seemingly bursting with restaurants serving food from across the globe, they actually don’t even touch the surface of what’s really out there to taste. It is absolutely fascinating (and delicious) to try the dishes the locals hold in high regard when travelling, so you’d hate to miss out on any next time you jet off right? 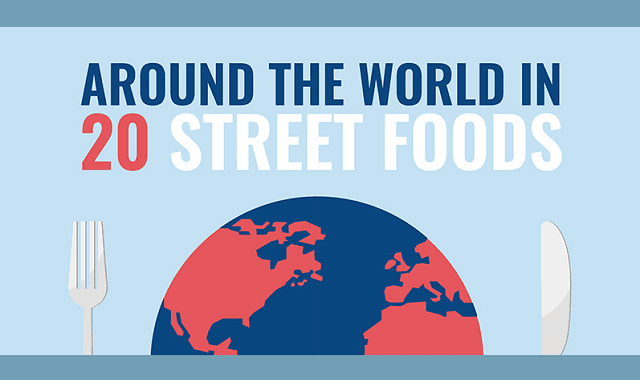 Sous Vide Tools have helpfully put together the infographic ‘Around The World In 20 Street Foods’ which lists all the dishes you need to try next time you’re abroad. From savoury to sweet, mild to spicy and the outright bizarre, there’s something in this list for everyone. Take a look for yourself.